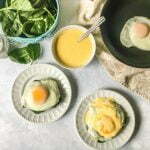 These portobello eggs with hollandaise sauce are a delicious low carb breakfast or lunch. Meaty portobellos, garlicky spinach and a sunny side up egg, topped with a rich and delicious hollandaise sauce. Clean mushrooms by taking of the stems and scraping out the gills. Spray with oil and add to a cookie sheet with the tops up. Meanwhile add the olive oil and garlic to a large saute pan for a minute or so. Then add the spinach for a few minutes so that it wilts a bit. Just a bit. When that is done, pan fry your eggs sunny side up. When the mushrooms are done, add them to the plates, top with spinach and then the egg. Now make your hollandaise by melting the butter in the microwave. Meanwhile add the yolks, lemon juice, cayenne, salt and pepper to a blender and blend on low for a few seconds to combine. Let the butter cool a little but make sure it's still liquid. Turn the blender on low and very slowly pour in the blender. When you have poured all the butter, turn up to high and blend for 30 seconds. Use immediately by pouring over eggs.